Halifax Fan have fully owned factories in both UK and China, from these facilities we can manufacture our wide range of fans in material from mild steel, stainless, and many alloys. From 15cm to 3m impellers and temperatures from -200 - 900C. Whatever your application Halifax Fan has the solution. Well established as one of the leading industrial fan manufacturers in Europe, Halifax Fan, with great clarity, identified the enormous potential for high specification bespoke fans for the rapidly growing SE Asian market. However, to access this market it was essential to close the distance between their UK plant and potential customers in Asia and took the decision to open a parallel manufacturing plant in China to serve the SE Asian market. In 2007 Halifax opened the doors of its first 1,000 m2 manufacturing operation in Shenzhen and from that point growth has been consistent and rapid. Two expansions later and Halifax Fan now has 54 personnel employed in a 4,000 m2 modern factory, building a wide variety of fans to the same manufacturing standards as those built in the UK factory. From the outset, it was critical that fans from the Shenzhen factory matched the high- quality, internationally recognised manufacturing standards of the UK designed and built products. To this end, ISO 9001:2008 and BS848 manufacturing standards have been implicated in the Shenzhen plant and guarantee fan quality, reliability and performance. This has taken a substantial investment in training and manufacturing machinery. Many of the Shenzhen personnel have spent time in the UK factory and UK personnel are regular visitors to the Chinese factory for training and monitoring of manufacturing standards. Innovotive ‘Cloud’ computing ensures consistency of information exchange between factories and that the UK designs are precisely enacted. Modern laser cutters ensure accurate translation of the designs to the component parts and the incorporation of slots and tabs in the impeller design ensures precise assembly and performance. Five years on and Halifax Fan China has an excellent health and safety record and a high staff retention level that is critical to the maintenance of their high quality reputation. Consequently, the Shenzhen plant has built many hundreds of fans since opening its doors, built from simple stainless steel through to high specification alloys for the most arduous duties. 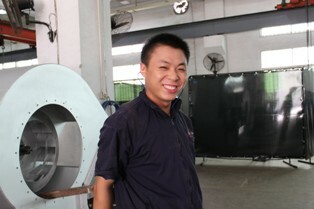 Many of these are for renowned European and US customers, in addition to supplying fans for customers throughout SE Asia. Demand has led to the opening of a technical and sales support office in Thailand and plans are in place for further expansion in the future. Halifax Fans – quality and performance you can rely on for years to come.